Posted On July 31, 2015 by Team iCynosure. A child is filled with curiosity as they adapt to the different things in this world. Be it their parents taking off to work each day or watching something in particular on the television. Each of my days being with a volley of questions from my little one, that some need answering, some need explaining and some need to be ducked. As a hands-on, do-it-all mother I pride myself in the way I have handled the home, my professional commitments and above all my little princess. Though I have been coaxed from time-to-time to introduce a full-time help to my daughter the thought just doesn't take seed with me as it means giving away any responsibility of the most cherished little person onto someone else; especially as I would have no control over her day-to-day activities and over a period my supervision would decrease. Not that I have any issues with giving up control, its just I need to know whats happening with my baby and in case of any occurrence of an untoward event, immediately stop it or take corrective measures. However, as children become more and more active, they will discover the World Wide Web, and parents will experience nightmares wondering what they are up to. Every day I see my little #PrincessHeer advancing step by step in the callous web of the internet and I keep wondering how to monitor her paths. Every time she swipes on the iPad or the mobile phone I want to hover around like mother hen and check what she browses, what advert pop up and what website open. All I think about is if she is safe or not, is someone stalking her or if she is being bullied. Whether she is reading watching the right content for her age or is she being clouded by inappropriate things. Gosh, every new technology has its share of problems. There are a lot of experts who reaffirm that the internet is a great place and there is absolutely nothing for anyone to worry about. However, with some of the recent events, it is better to be careful and thus come the possible solutions. Keeping children away from the internet is a practically impossible task but securing their safety isn’t. Numerous applications have been developed over the last few years to track your child’s online activities and one such application is eKavach. I found an opportunity to check the eKavach app as parent bloggers with India’s largest community of bloggers, Blogadda. 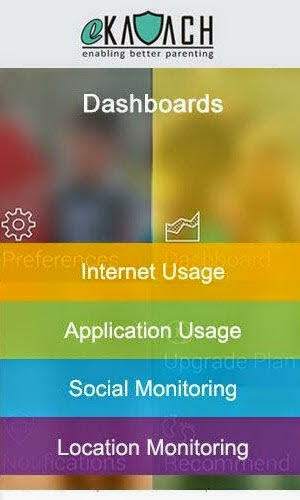 Positioned as India’s first digital parenting application launched by Certus Technologies, eKavach is designed to engage, manage and monitor children’s online activities without intruding their privacy in person. eKAVACH provides parents with the necessary information via the monitoring tool, to enable us to set the desired boundaries to secure our little ones. It is simple, yet real-time the enables us to understand our child in their new online world. The application is available on GooglePlay Store and it’s free to download and install to both the parent and child devices for optimum use. 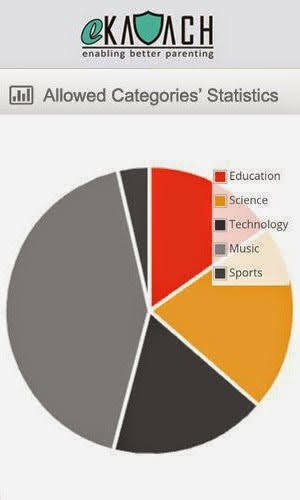 The parent app receives updates about the child’s online activity in form of graphs to include the amount of time spent by the child on various sites and applications on the internet. Parent can set certain restrictions on the search categories and applications on the child device with the help of keywords and time limits. Not only does this feature ensure a safe browsing experience for the child but also sets the maximum time spent on the screen per day. The most important and relevant feature of the application that allows you to customise what your child visits on the internet. When certain site categories or application beyond the set guidelines are tried to be accessed, the parent receives an instant alert. It's always better to be prepared just like most parents believe. 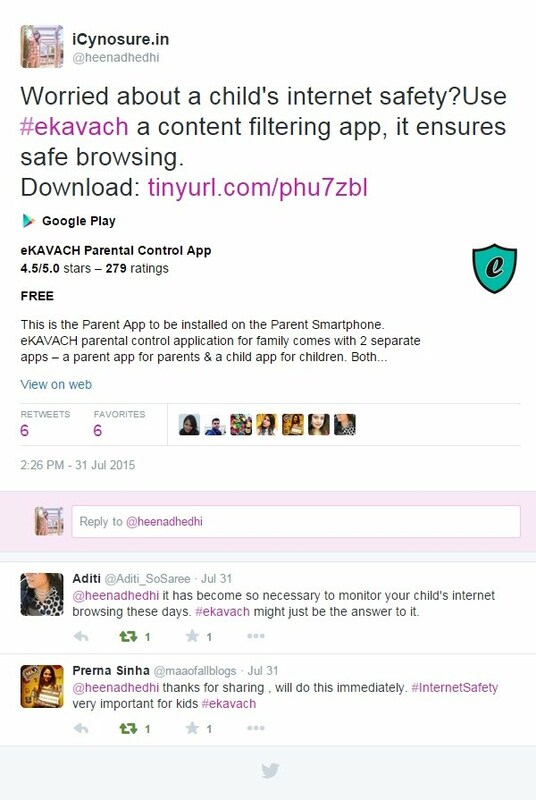 So if you want to be worry free, eKavach is what you need - a Kavach to protect your child online.